UNREGISTERED ALIEN AT ST. ANNES. At Lytham Police Court, on Tuesday, Cornelies William Nieuwerf, a Dutchman, and who said he had lived in England for 36 years, was charged as an alien residing in a prohibited area, St. Annes, and with failing to register, as required by the Registration of Aliens (Restriction) Order, 1914. Defendant pleaded ignorance of the law’s requirements, and said he registered at Birkenhead in November last, and was there told he could go where he liked as a friendly alien. Mr.S.L.Stott, the chairman, said the Bench hoped the case would be a warning to others because if further cases came up they would deal much more severely with them. Corpl. 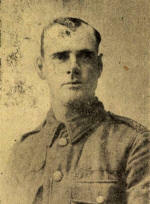 Harold Law, 2nd Shropshire Light Infantry, of 7, Glen Eldon Road, St.Annes who was killed in action on May 9th. He served through the South African War, and was wounded last March. On recovery he was sent back to the trenches. ST. ANNES -VOLUNTEER TRAINING CORPS. Sir,--The Corps, having been drilling and training for some months, the time has arrived when it is necessary to furnish the Corps with service rifles, for the defence of the town in any emergency which may arise. At first it was thought the Government would provide them, but the demand from the front is so great that the committee have decided to provide rifles as is being done in many other coast towns. Some of the members will provide their own, but it is hoped the gentlemen and ladies of the town who cannot themselves do the needful training will provide the rest. The cost of a rifle is £3 10s., and the committee will greatly appreciate offers of one or more. Already a number have been presented, and this appeal is made so that the remainder may be (quipped and the force be made effective as soon as possible.—On behalf of the Corps. President, Council Offices, St. Annes.